Metal roofs are designed with durability and style in mind, providing both a functional and aesthetically pleasing finish to your roof. There are five common types of metals that can be used as roofing materials, and each has distinct advantages and disadvantages. 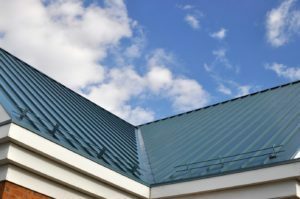 You should understand what each type of metal roofing has to offer so you can choose the best material for your roofing needs. Steel is one of the most common types of metals used for roofing and construction purposes, largely because of its high degree of natural durability. Steel roofing panels and shingles will usually be coated with another metal (such as zinc) that helps protect them from rust and corrosion that water exposure can cause. Steel also offers a wide selection of different coloring and shading, which is baked onto the metal itself. This layer of paint acts as a secondary level of protection against water and weather exposure. The main downside associated with steel as a roofing material is its weight. You’ll have to have your roofing supports professionally checked to ensure that they can hold the load of a steel roof without caving in. Furthermore, the hefty weight of steel can make the installation process lengthier and more complicated. In addition, while steel is coated in layers that help keep rust away, those layers will wear off over the course of years, causing your roof to begin to degrade. Additional coatings can be applied, or the roof can be replaced, but either way steel roofs will require some long-term maintenance. Roofs made of aluminum are a compelling alternative to steel as a roofing material. Aluminum is lightweight, which means that it can be installed on any roof without worrying about the load bearing capacity. Further, and perhaps most importantly, aluminum is completely immune to rust, which means that it won’t degrade over time no matter the climate it is exposed to. Aluminum can also be painted to customize the appearance of your roof. However, aluminum does come with a significant downside: aluminum is a relatively soft metal. It won’t be able to withstand physical trauma as well as steel roofing will. This means that hail, falling branches and other pieces of debris can actually cause dents or holes in your roof that can be expensive to fix. Copper provides a highly durable solution to your roof. Like aluminum, copper is completely immune to rust, but this metal also possesses a number of antibacterial qualities that prevent mold and algae growth on your roof. Further, copper will develop a natural patina over time based off the weather exposure that it experiences, giving your roof a truly distinct appearance. The main downside of copper as a roofing material is its extremely high price point. While copper won’t rust or need constant cleaning, which will help keep long-run costs down, its high initial cost makes it harder to fit into a budget. Zinc is similar to copper in that it is naturally resistant to rusting and corrosion and will prevent mold and algae growth on your roof. These features cut down on overall maintenance. Unlike copper, however, the patina that zinc develops over time can actually cover up small scars and nicks on the roof, which allows zinc roofs to maintain their appearance longer. However, zinc also suffers from a high price point comparable to copper roofing. In addition to its initial cost, zinc will require frequent cleaning to maintain its appearance. When zinc is exposed to water, the metal will build up a white, chalk-like residue on the roof that can ruin the aesthetics of your roof. Finally, zinc is relatively soft, which means that physical damage can pose a problem. For any of your roofing repair or installation needs, you can contact us at Burke’s Roofing. Our staff of highly trained professionals will be happy to answer any questions that you may have.